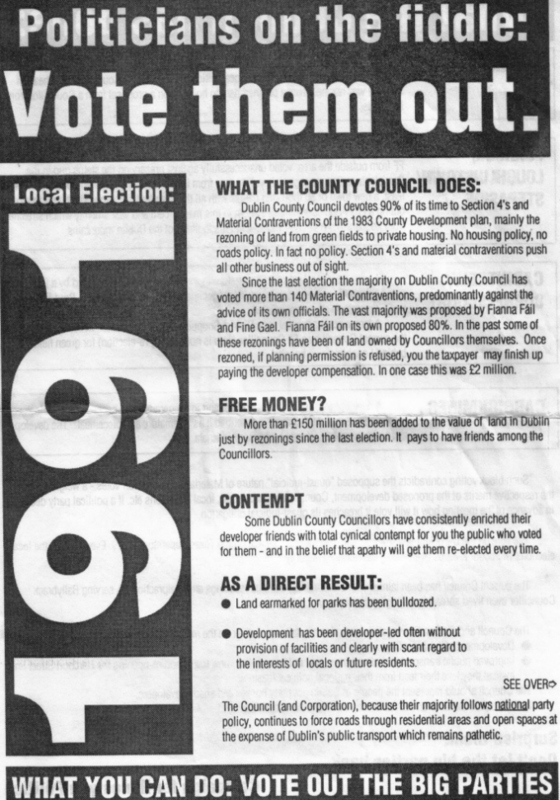 1991 Local Elections and a leaflet from the ‘Campaign for Honesty in Politics’ to Vote Out the Big Parties. As tribunals have shown, they were more than correct about ‘Politicians on the Fiddle’. I had it filed away with Green Party material from Ballybrack if that provides a clue to anyone. The Green Party and The Workers Party were the only ‘Small’ Parties to contest Ballybrack and Blackrock. Sinn Fein contested the Dun Laoghaire ward. Anyway I’d love to know who was behind the leaflet. As you can see the issues covered are on the Southside of Dublin. Some of the lands mentioned may have been part of the now infamous ‘Jackson Way’ land. It also illustrates the cynical way councillors were using their vote. Also mentioned is the compensation that councils had to pay developers when they refused planning permission.